During Spring Agora Bergamo, our magazine got some space to hand out the certificates for Local and Member of the Month. 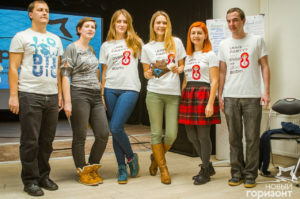 One local in particular had a nice surprise, AEGEE-Voronezh, that discovered they are the Local of the Month of April. We asked Svetlana Merenkova, President of the local, some questions to know more about this them! You were selected as the Local of the Month of April. How does it feel? It feels great. We didn’t expect it and were overwhelmed with joy when it happened. The reason why you were selected was your Network Meeting, how was it? Our NWM “Let’s Twist Again” was a successful event full of new ideas, active discussions and AEGEE spirit. We liked it a lot and hope that all our participants did as well. It gave us the motivation to continue our work and develop our local as much as possible and be more active. What is the strongest asset of your local? Definitely the people. We are a team and each of us contributes a lot to the development and success of our local. We are all different, but share the same ideas and passion towards AEGEE. What does AEGEE mean to you? AEGEE is a mix of everything that young people can dream for: self-development, new opportunities, a chance to really make a difference, great people and experience, which you can’t compare with anything. It’s far more that just and oganisation. AEGEE is a way of life. How has AEGEE impacted your community? AEGEE-Voronezh is a small antenna and we can’t say that our community was impacted much by this fact since AEGEE was established in our city, but we are trying to do our best to change that. For example, this April we were involved in “Clean April”, an event dedicated to separate trash recycling. These were small steps towards changing our community for the better and we are hoping for more. Currently we are organising two Summer Universities, so for now these are our main priorities, but we also have other plans and hopefully you will hear about them soon. You can learn more about Local and Member of the Month here.